What is bastille? 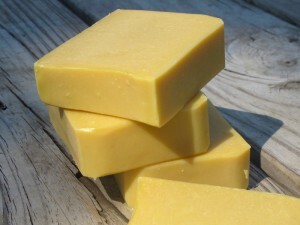 Bastille is a term affectionately coined by soapers for soap that is made with a high percentage of olive oil. Castille is 100% olive oil soap and bastille is soap made with 70% (or more) olive oil but contains other oils or butters. Castille on its own is not very bubbly but if you add a bit of coconut oil and buttermilk you can boost the bubbles a bit but keep the mildness of the high olive oil content. Buttermilk contains sugar which helps boost the bubbles as well. I love this recipe. Its simple with just two oil ingredients (olive and coconut), is colored naturally by using carrot baby food (pureed carrots) and makes a great soap for baby or for those with sensitive skin. This recipe creates a super mild soap that still has a good lather. There are many different techniques when using milk in making soap. 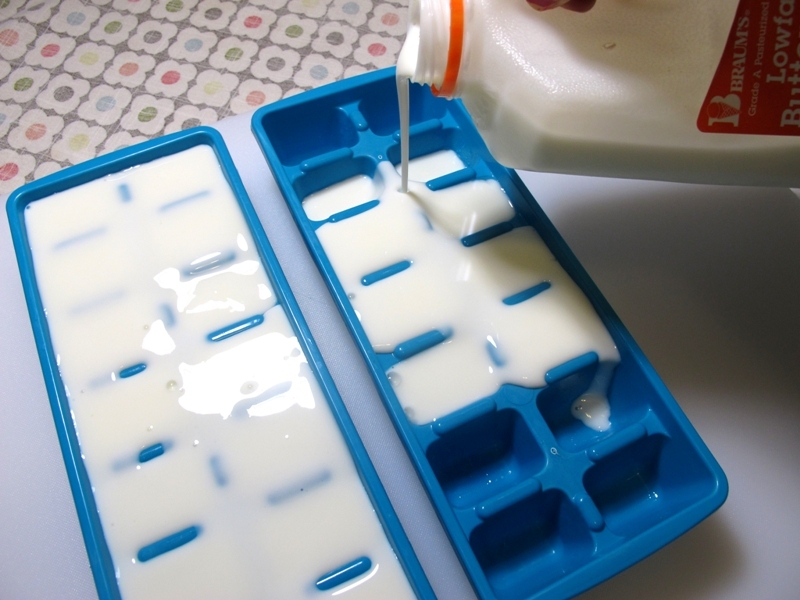 My favorite is to freeze the milk beforehand in ice cube trays. Milk contains sugar and heats up quite a bit when you make your lye solution. If you freeze beforehand it will help keep the temps down. So fill up an ice cube tray with your buttermilk and have that frozen beforehand. The next step is to make the lye solution. The milk doesn’t have to be frozen solid but should be nice and slushy. Weigh out 8 oz of slushy milk and add the 2.5 oz of pureed carrots. To help keep the temps down when adding the lye, you can set your lye container in an ice bath. As you add the lye and stir…this will keep it from scorching or burning the milk. Measure out the olive oil, coconut oil and melt. Usually I don’t heat olive oil…I’ll add it to melted solid oils and butters. Add your lye solution to the heated oils and stickblend until you reach trace. Be prepared, this recipe may trace quickly! Check out that beautiful orange color! I don’t add fragrance to this soap since it is for babies or people with sensitive skin but if you’d like to add a fragrance or essential oil do that now. Then pour into your mold! After 24 hours, slice up and cure. High olive oil soaps do better with a longer cure time. I like to cure this soap at least six weeks. Ok so I rebatched my first loaf because the slices were TERRIBLE (non rebatched mini brain shaped jello mold remains as overflow from loaf mold). The 2nd batch I colored with some cocoa powder and funnel poured. All of it I substituted pumpkin mush for the carrot baby food since I have a freezer full of the stuff and it gives off the same creamy orange color. Sorry not to fbook on Bramble Berry page_ trying to be sure to conceal the existence of yet curing bubbly blocks of baby cleaning goodness from various persons and would really dislike accidental advanced cats being let out of proverbial bags that fbook is so good at poking holes in . . . even when you think you have them sew shut with steel wire, locked in iron trunks, and cast into the core of giant concrete blocks. . .
Magnificently perfect solution to what to gift create for the way too many people I know who are having or have already babies (many of them multiplets_ yes made up word) right now. It’s like being under a perpetual waterfall of other people’s offspring, one cannot sew all those precious little goodies fast enough, and it’s too expensive to buy that much baby giftie. You may never fully appreciate the gift giving ditch you have helped to dig me out of. Looking forward to reading all your info. and getting into soap making! P.S. If you haven’t already joined the rest of our soapmaking community on Bramble Berry’s Facebook page, we’d love to see you there! I have many avocado trees and wondering if I can add in avocado as an ingredient and color. Is this a good idea? Would I add in the avocado as is or have to puree? Any suggestions/comments would be greatly appreciated. BTW, new to all soap making. If you would like to add your Avocado to this recipe, I would suggest making a puree of it and adding in place of the Carrot Baby Food. We’ll be super excited to hear how it turns out! Be sure to keep us updated. I have never made soap before, besides laundry detergent. Recently got diagnosed with eczema, and was wondering if you knew if this was sensitive enough for that? Just made this soap, but if I do the zap test it feels like a battery. Where did I go wrong? If you could tell me a bit more about your technique and if you added anything to this recipe, I would be more than happy to help you out troubleshoot so we can figure out why your soap was lye heavy. I am in the early stages of learning about soap-making. I am interested in creating a “vegan” version of this recipe. Could the buttermilk be replaced with coconut milk? If so, would the amount be the same? Would the coconut milk scent the soap? For any milk recipe, you can actually substitute out one milk for another. And, in any soap recipe, you can use the liquid (distilled water) as milk as well. The Coconut Milk may give your soap a slight scent, but if you really want it to pop, I would definitely add a fragrance to it. I would suggest something summery like Summer Melon Spritzer or Summer Fling Fragrance Oil. I would also check out this great book that Anne-Marie wrote on making milk soaps. It has several different techniques that you can use as well as some helpful hints, tips and recipes! I constantly refer to it when I’m making my milk soaps and find it to be a great resource. I appreciate the information. Many thanks…. I’ve never made CP soap before but I’m considering making this recipe. What is the shelf life on a soap like this with buttermilk and baby food in it? I need some help. 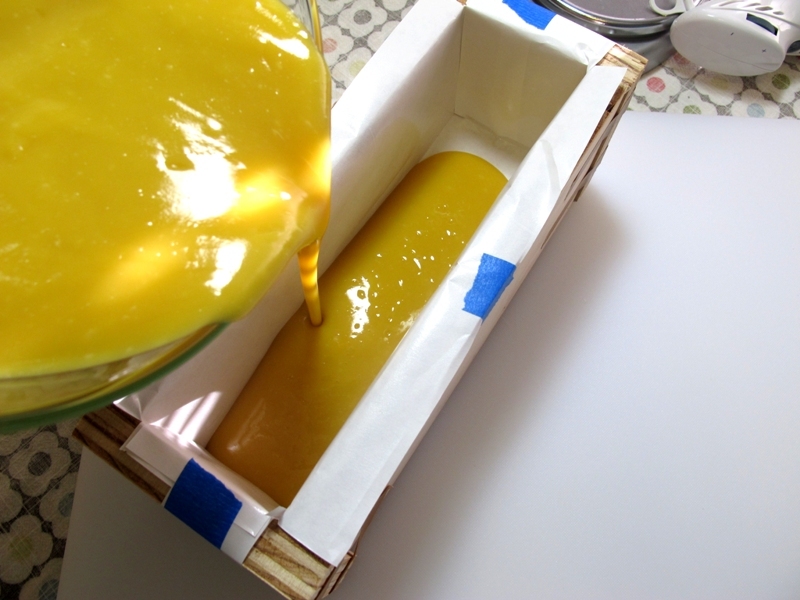 I want to make a Bastille soap fusing this recipe with another from The Otion Blog, but I dont know how to use the lye calculator in order to know how much of everything I need. Can someone help me? I already know the ingredients I want to use, just dont know the amount. I want to use olive oil, coconut oil and for the lye solution aloe vera liquid. How do I know the amount I want to make? Measuring the mold? Sorry, but I have never used the lye calculator or made my own recipe. Have always used the standard recipe received when took a class. Once you’ve gotten the cubic inches, you multiply that number by .40 to find the amount of oils (by ounces) in your recipe. After this calculation has been figured out, you would enter that amount of oils into a lye calculator to get the final recipe. If you are wanting to use Aloe Vera Liquid in your recipe, you can actually substitute the whole amount of water from the recipe you are wanting to use. 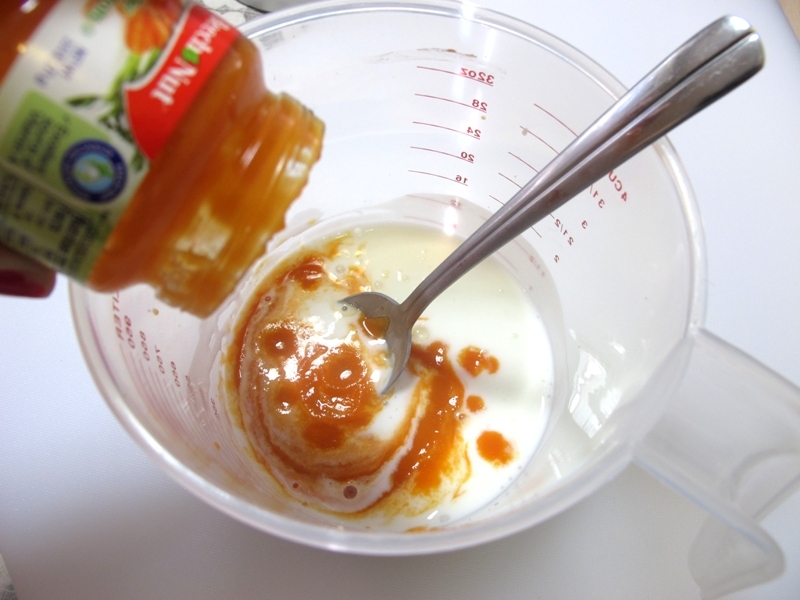 Just make sure to run your recipe through the lye calculator to get the correct lye and liquid amounts. Ok so I have never made soap before and this will be my very 1st recipe! I do have a question though. I am making this for my new addition who is due any day now! I don’t want to wait the 6 weeks for it to cure to be able to use it on him. Do you think I can put it in the oven for a CPOP process? Do you think that will scorch the buttermilk? If you are going to be making this cold process recipe, we definitely suggest letting it cure for 4-6 weeks to make sure that it is mild enough to be used on even the most sensitive of skin. the Teach Soap forums as there are many soapers there that do CPOP and could offer you some great advice on buttermilk milk in CPOP-type soaps. This soap is an extremely mild recipe (because of the buttermilk and baby food), and the pH is within the recommended rate for cold process soaps. If you want to test it, you can use the handy pH strips from Bramble Berry’s website. Something about me just cringes at the baby food. Don’t know why, I just don’t like the idea! Can I substitute it with more buttermilk or just water? If adding baby food into this soap doesn’t work for you, you can actually remove it and add either add water or additional buttermilk. Just remember to run your recipe through the lye calculator if you change any of the oils in the recipe. I am not a from scratch soap maker yet what could I do to make a M&P version of this but still have the same quality. Good morning, Victoria! We are so happy to hear that you are getting into soapmaking, it’s such a fun thing to do. If you want a similar ‘milk’ type soap but in a M&P version. I’d try out our Goat’s Milk Melt and Pour base. It has a very creamy lather, and several skin-loving oils and butters in it. Could you use goats milk instead of butter milk? And what else could you use to color the soap? My sister has extremely sensitive skin and she can only use Dove Sensitive Skin. So I am on the search for a great soap to make for her! thanks also dose the soap turn brown because of the carrots, I have learned that adding anything like lavender buds or plants to my soap go brown after a while. what if I didn’t add the carrots? what color would the soap be? or can I add colorant to it like a pink or blue and what type is the best to use. Thanks for the great question. Anytime that you add a fresh ingredient to a cold process soap, it is eventually going to go brown. If you didn’t add the carrots, the soap would still be a yellowish hue because of the buttermilk. If you wanted to add a color to this recipe, you could, and it’s totally up to you which one you choose. And there is even a Rose Clay that would make a very nice pink. if i was add some rice bran oil to this how much should I add and how much do i delete from the olive oil. I dont want gooey soap. Make sure you run it through the lye calculator again because your water and lye amounts are going to change. You can also go with the recipe above and add some Sodium Lactate to help harden up this bar. We’ve used it in the past when working with Olive Oil-heavy recipes and have found it works like a gem. I’ve made this recipe twice now and for the most part, I love it! Low lather, skin softening and palm free…great baby soap 🙂 It does, however, have that gooey feeling from the high percentage of olive oil when being used-even after several months of curing. I’m wondering what oils you might suggest substituting for a portion of the olive oil to minimize the gooey feeling while retaining some of the bar’s great qualities? This is such a moisturizing and lovely recipe, but I do understand how it can be a bit soft due to the Olive Oil. You can actually add some Sodium Lactate to this recipe as a hardener or add a bit of Rice Bran Oil which will also help to harden it up. =) I hope this helps! I know this is a bit off-topic, but I’m hoping that you can offer some insight into why lye calculators vary so much. I love that SoapCalc.net offers hardness/creaminess values for new recipes but when I go to cross reference my lye and water they don’t match up with Bramble Berry’s lye calc. results (even when I play with discounts)!??? I’m not sure which calculator I should be using or perhaps I’m missing something obvious here…any thoughts? I’m interested in making this recipe but have put it through the lye calculator and can’t get the liquid content to add up. Are you superfatting at 5%? Is liquid content the combination of buttermilk and pureed carrot? Thanks – it looks devine. When Amanda made this recipe, she did do a bit of a water discount and didn’t use lye calculator to get her water amount. I’m reposting one of her comments from above and it should help explain it a bit more. Amanda: Ohhhhhh…this is kinda an odd ball recipe. I don’t use calcs to get my water. oils and what I’m trying to do. But this one is a bit odd. You can also plug this into a lye calc and use the numbers that they give you. I did do a discount on it because of the high olive oil though. It’s taking FOREVER to trace.. is that normal? I know it has a very high oo content.. I am also new to soaping but I am anxious to try this recipe. I noticed in one of the replies that you said to add the carrot mix to the lye. Shouldn’t that be the other way around? Yes, you would add the lye to the carrot/buttermilk mixture and mix. I just found about this recipe and I can wait to try it. I am from Panama, Central America, and we do not have buttermilk. Can I use one homemade? (1 tbs vinegar + milk to iquals 1 cup) that is the way we use it for cooking. I was tempted to use milk instead of buttermilk but read up in one post that it does not behave the same in soapmaking. Any recommendations for me? or just distilled water? I’ve made soap a few times, so I thought was ready for this. I’ve never made a milk soap before, though. I made this yesterday and just unmolded it. It came out very dry and brittle. When I try to cut it, it just breaks apart. I followed the recipe, except I pureed my own carrots–I didn’t have baby food. 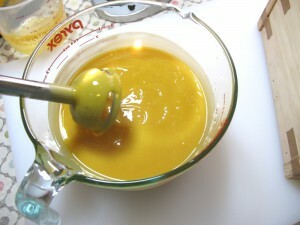 The puree resembled baby food to me. I also added 15 ml of peach FO.Any ideas? P.S. Did you make sure to freeze your buttermilk before you soaped with it? I think I figured it out. I kept the frozen buttermilk too cold. I made it again and didn’t put the bowl in the ice water bath until it started to get above 130 degrees. Last time, the milk and lye only got up to about 96…I kept it cold! The recipe was right off your website for baby bastille. I would like to try this recipe using the HP crock pot method…has anyone ever tried? Any tips? We’ve never tried the HP crock pot method with this particular recipe, but I’d be a little concerned about the buttermilk in this recipe and how it might scorch and burn when the heat is applied. But, if you were to try it out, make sure you do a super small batch first. You can also ask over at the Teach Soap forums to see if any of the soapers there have attempted a HP milk soap and how it turned out for them. I love this recipe and made my first batch of it last week in a new tiny mold i built. It looks beautiful and smells lovely. I have a question in regards of the baby food aspect of the recipe. My friend brought me an assortment of different fruit baby foods. They contain either Stearic Acid or Ascorbic acid. Would these effect the soap negatively when adding it? I would love to use the strawberry banana or apples and blueberries but have no idea what to expect and I don’t want to waste supplies. For personal use…I would give them a try and I don’t think they would effect the soap. If you sell…I wouldn’t use them just because those are additional ingredients that you would have to list on the label. But I think the stearic acid or ascorbic acid would not be enough to mess with the soap. Yes, you can use 7 oz water. And yes, if you run the recipe through a lye calc it will probably recommend more water. With higher water it will take longer to unmold, be softer and take longer to cure.. Thanks so much for your answer! I am excited to try this recipe. PS: I <3 Lovin' Soap! It's such a great resource! I am curious about the liquid content too! Can I substitute distilled water for the buttermilk in the exact same amount, 7oz for 7oz? I am new to soapmaking and it seems that milk can sometimes be tricky. Also, if I don’t want to mess with the water discount and instead run this through the BB lye calculator, how will that affect my recipe? Will it just take longer to trace and to cure? Can I eliminate the buttermilk altogether? Also, would I subtract the carrot puree from the water if I were to do this? Yes, you can use water instead of buttermilk. Just sub for the same amount. Keep the carrot puree the same as well. So you would use 7 oz water and 2.5 oz carrot. I just wanted know what the follow up answer was on the “white dots” in the soap? (Lye or coconut oil)? I just made a batch of Goat’s milk soap and the same thing happened to me. I’d hate to throw it out! Is there any way to save it if it is undisolved lye? I know rebatching would be an answer, but how the heck do you do that? I’ve been soaping only for a year and have used the same recipe for that past 5 months…I did use the Mango Peach Salsa FO. GM was Frozen and lye was added to it slowly. I guess I didn’t stir enough and had a rock like orange thing at the bottom and I fished it out and threw it away. I think it was burnt lye/Milk that didn’t get stirred or could just be old milk? I froze the milk in June. Okay, I’ll shut up now…:-) Any Help would be greatly appreciated! Thanks a bunch…I’m Stumped? The best way to test if your soap is lye heavy, is to do the ‘zap test’. All you need to do for that is lick the soap as you would with a 9-volt battery, and if it zings, then it is lye heavy. Goat’s Milk can be a bit tricky to work with, and you just need to remember to stir, stir, stir once you’ve added the lye. Ah, ok…I just wanted to make sure I wasn’t missing anything obvious 🙂 I did go ahead with the recipe according the lye calc and so far so good…I’ll let you know how it turns out. In regards to adding plant material to soaps, is it typically ok to add puree to a soap recipe without the use of a preservative (say, figs or something of the sort)? This is the first time I’ve used puree and I’d love to experiment more!! When adding puree (of any natural kind) to cold process soap, it is never necessary to add a preservative to it. But remember that any perishable item that you add to your soap can eventually go brown. Ohhhhhh…this is kinda an odd ball recipe. I don’t use calcs to get my water. Quick question–when I divided the recipe by 2.5 and plugged 10.8 oz olive oil and 2 oz coconut oil into the lye calculator it said that I would need 4.2 oz liquid where if I simply divided the entire recipe by 2.5 it would seem that I only need 2.8 oz of liquid (7+2.5/2.5). Any thoughts on this?? I would like to know this too. 🙂 I ran the original recipe through the lye calc and it seems like she did a water discount. Am I correct in thinking this? This has one ounce of liquid less than what the lye calc gives. Hi Naomi – they are mostly used for color and label appeal. Carrots do contain antioxidant properties and beta-carotenes but do these things get destroyed by the lye? I’m not real sure. I am new to soap making and will be attempting some recipes in the near future. I love that you’ve used the pureed carrot to colour your soap. Do you use this as part of your water content? This is cold process bar soap right? Sometimes the Buttermilk and Carrot Baby Food can cause the soap to smell a little odd to some people as, but after you let it cure that weird scent should evaporate. Did you add anything extra to this soap? I tried this with goat’s milk and came out with white spots in my bars when I cut them. I froze the milk, stirred as I added the lye, mixed well (I thought) and saw no indication of spots when I combined with my oil. Could this be undisolved lye? I’ve never had a failed batch so I’m totally in “panic mode” now. Hi Summer! Do you think that it could be air bubbles? Or it might be that the coconut oil has started to harden. We would love to help troubleshoot this for you, but it is a little hard without seeing the soap. Send us some pictures to info(at)brambleberry(dot)com and we will help you figure out what is going on! Can the olive oil be replaced with another oil? Ok I am really excited about making soap for my girls :O) I have NEVER attempted to make any kind of soap before so I have no clue what I am doing. I am a little confused about the lye . Here is says to make the lye solution so is the lye made from the carrots and the milk or are you meaning that it is something that you melt. The next step is to make the lye solution. The milk doesn’t have to be frozen solid but should be nice and slushy. 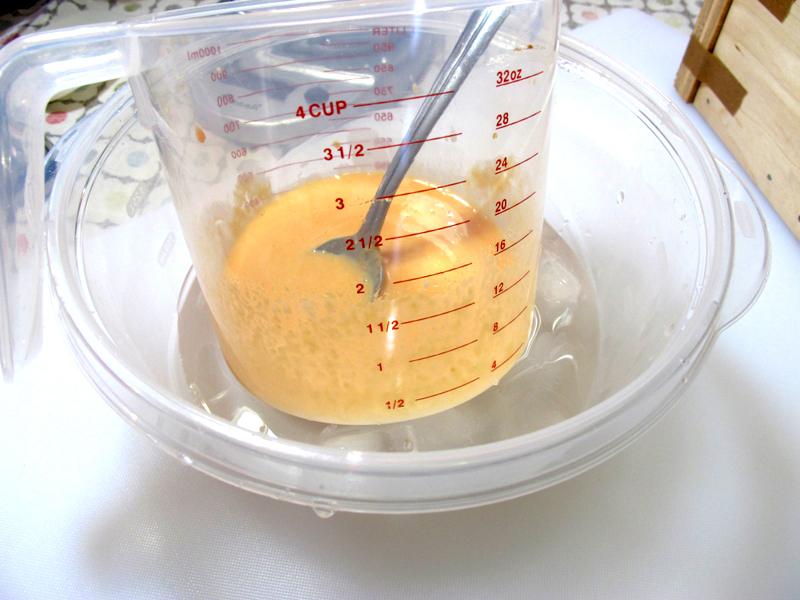 Weigh out 7 oz of slushy milk and add the 2.5 oz of pureed carrots. Also wanting to use all organic ingredients is that possible to do if the lye is something that I have to buy ?? Welcome to the Soaping World Lindy, we are so excited to have you! If you’ve never soaped before, we suggest watching these videos on CP soap to get yourself oriented. In this recipe, to get the lye solution, you will first want to mix your 7 oz. of slushy buttermilk with the 2.5 oz. of pureed carrots. After mixing well, you will add this to your 4.3 oz. of lye. You will mix these two together very carefully (due to the lye). Lye is necessary for soap to be soap. If you don’t have lye somewhere in the process, it isn’t soap. If you are worried about working with lye, I would suggest starting with melt & pour soap. I hope this helps! Can I substitute the buttermilk with something else? If so, what can I use instead? Thanks for the question Ruth! You can definitely replace the buttermilk in this recipe with anything else you’d like. Many people love using goats milk in this recipe because of its creamy lather and great skin-loving properties! I just used cow milk… I don’t know any goats to supply me. Actually, I don’t know any cows either. Anyways, it seemed to me like the milky thickened a bit like buttermilk, and buttermilk is just spoiled milk… So, in my mind cows milk is the same as buttermilk. You can often find local goat’s milk suppliers and you can always ask on the Teach Soap Forums to see if there is anyone near you that provides it. So I just found this recipe and am interested in trying it but I also found a recipe for making soap with breast milk that sounds intriguing. Could you replace the goat’s milk with breast milk? If not, why not? I haven’t make any soap with breast mil yet, but have read that the lather will vary depending on the fat from the breast milk. You can definitely use breast milk in place of water (or milk) in cold process soap, but as with all milks, you will want to freeze it beforehand to prevent the milk proteins from scorching in your soap. You are correct about the lather of the bar, it will change depending on what sort of milks you use in it. Keep us updated if you do end up trying it out! Thanks so much for the baby recipe! I can’t wait to try it for my little one. Can I leave out the lye and have the soap still work? No this is cold process soap and without the lye it will not be soap. Is this for a 4 lb loaf? (12 4-5oz bars?) or 2lbs? It seems like 2 lbs? How many bars does this make? If I want to double this recipe, is it just as simple as doubling the numbers of the ingredients? If I want to add some chamomile to this, how much do you think I should add? Thanks!! This will be my first time trying soap! Do you need to cover this once it is poured into the mold? Will it heat up too much with the buttermilk? I can’t wait to try this recipe. This will be my first attempt at CP soap. Trisha, Go for it – its so much fun. Once you get hooked that’s it. I’m a novice – started in August & loving it. I’ve made about 10-12 batches already & wouldn’t go back to bought soap. It’s so nice to have soapqueen to assist with our questions. This might sound like a dum question, but will the carrot’s spoil in the soap? I’m freezing the buttermilk right now – anxious to try. I just did this and used Lavender Chamomile (Huggies) fragrance. Thanks so much for the easy-to-follow instructions! That’s the perfect fragrance to use with this gentle recipe! Hi! I love this recipe! One question though… can you substitute the carrots for anything else, I’m just curious as I’m not sure what the carrots do for the skin. This soap looks so amazing! milk and babyfood? how much more delicious can it be!? AAhhh! I got my brambleberry packet and I am so afraid to start!! But I want to do it so badly! Thanks For posting this recipe! Can’t wait to make this one for my kiddos. Yes, you can definately use buttermilk powder. Just add a slurry at trace. Thanks! I am going to try it for my daughter. She wants more lather to my regular catille. I usually make my castille with goat’s milk and it’s lovely. I’ve made soap using carrot baby food, but never thought about putting it in my castille… hmmm I’m going to try that next time! Thanks! I love our new stamps! That’s going to be a great final touch to the final soap! Love it! Baby food? Whoulda thunk?! I do love carrots and buttermilk together. To go a step even further, the olive oil could be infused with calendula like I do for my calendula carrot buttermilk soap. Very nice! I love that idea of using infused oils. It sounds like you have a wonderful recipe! Great post Amanda!!! Thanks for sharing it. I love the color of this baby soap. Question: You did not mention any buttermilk/lye and oils temperature. She freezes the milk and puts it in an ice bath when adding the lye to the milk. Try to keep the temperatures low so the milk doesn’t scorch. 110-115 sounds like a good temperature range to me (since that’s the temperature that we normally soap with). I don’t take temps but I probably should have for this one just so I could have told you. But yes, 110-115 sounds good. Thank you so much for posting this! I’ve been looking for a good gentle soap recipe for babies for a while, can’t wait to try it! Love this recipe. Would you be able to tell me what size mold you use? Thanks! This recipe would be about 2.8 lbs and you would need to go with at least a 3 lb or higher mold. I’d suggest using our 4 lb. Wooden Loaf Mold. Thank you so much. I made it and it turned out great. I substituted the buttermilk for goats milk. I am really bad at using the soap calc. I need to practice.